BuddyPress 2.8.0 “San Matteo” is now available for download from the WordPress.org plugin repository, or right from your WordPress Dashboard. “San Matteo” focuses on various improvement for developers, site builders and site managers. To continue the migration of legacy code to modern standards and techniques necessary for the BP REST API project and other new features moving forward, BuddyPress 2.8 requires at least PHP 5.3. This will allow us to build better, robust, and secure code, benefiting developers and users now and in the future. When you click on the username on the “Users > Manage Signups” page, you can now view profile data entered by the user at the time of registration. 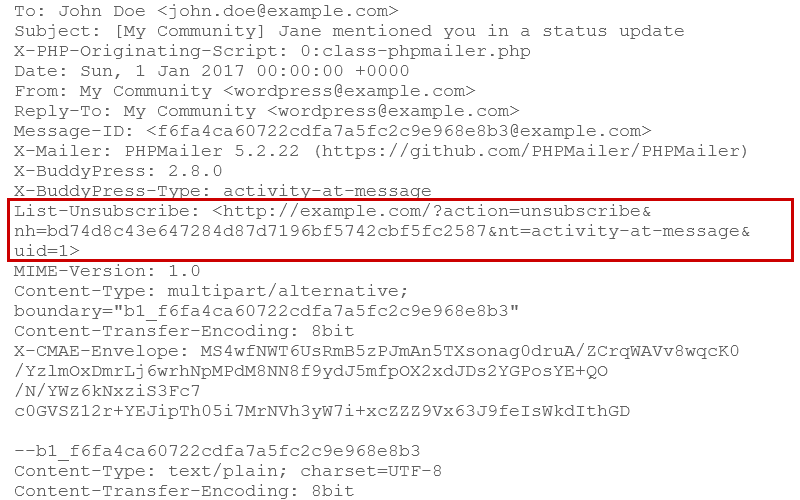 Allow users to unsubscribe from BuddyPress email notifications in some email clients such as Gmail (web), when properly configured. 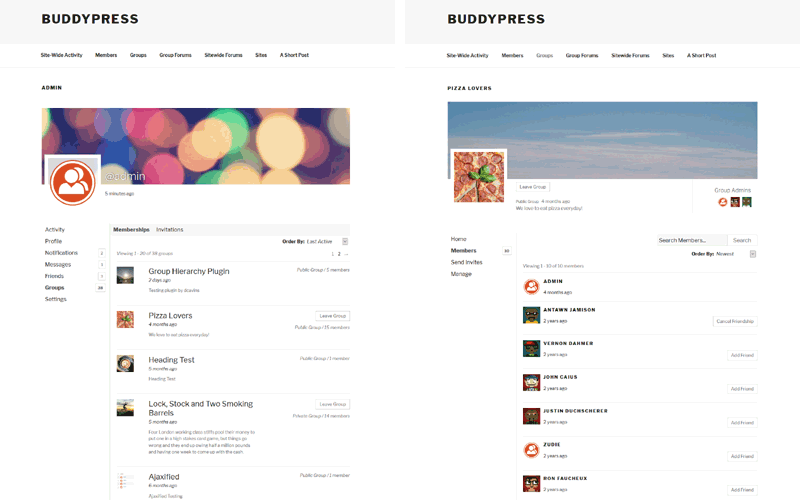 BuddyPress looks great in WordPress’s latest default theme with the new Twenty Seventeen companion style sheet. To change the default two-column page layout to a full-width layout as seen in the image, add the following code to the functions.php file of your Twenty Seventeen child theme. We’ve added new filters and actions for different methods throughout the Messages component. The new search_column parameter allows developers to specify which columns should be matched, as well as where wildcard characters should be placed, when searching via BP_Groups_Group::get(). The groups widget can now be sorted alphabetically, in addition to sorting the results by recently active, popular, and newest groups. Developers can specify which PHPMailer should be used when sending BuddyPress with a new filter. We continue to improve our localization internals, making it easier for translation editors to ensure that BuddyPress will be available for everyone in their own language. 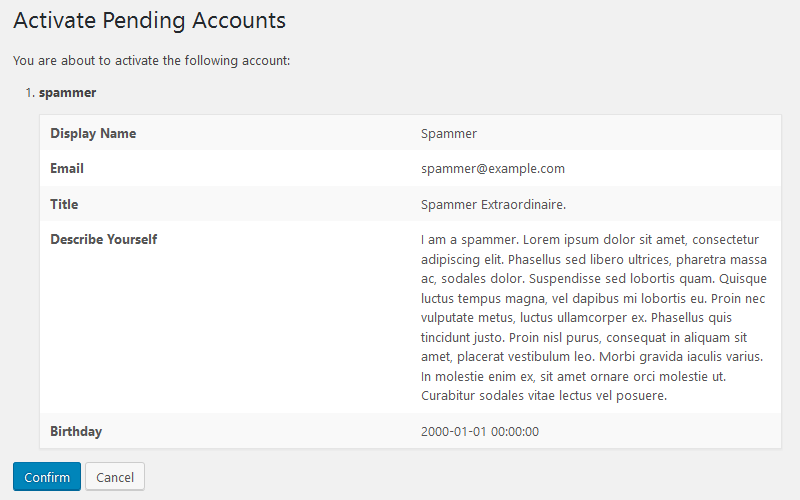 Regular updates to inline code documentation make it easier for developers to understand how BuddyPress works. Continued improvements for universal access help make BuddyPress back- and front-end screens usable for everyone (and on more devices). Read about all the bug fixes and feature enhancements introduced in BuddyPress 2.8.0 at our official 2.8.0 changelog. Andrea Tarantini (dontdream), Ankit K Gupta (ankit-k-gupta), angeljs, Boone B Gorges (boonebgorges), Brandon Allen (thebrandonallen), Bunty (bhargavbhandari90),chetansatasiya (ketuchetan), Chirag Patel (chiragpatel), danbp, David Cavins (dcavins), Dennis (wpdennis), Diana K. Cury (Dianakc), finzend, Hugo (hnla),J.D. Grimes (jdgrimes), John James Jacoby (johnjamesjacoby), Jonas Lundman (jonas-lundman), jonieske, jreeve, lakrisgubben, Laurens Offereins (Offereins), lgreenwoo,maccast, Mathieu Viet (imath), mchansy, mercime, Michael Beckwith (tw2113), modemlooper, Mustafa Uysal (m_uysl), Nick Momrik (nickmomrik), Paul Gibbs (DJPaul),paresh.radadiya (pareshradadiya), Petya Raykovska, r-a-y, rekmla, Renato Alves (espellcaste), Roger Coathup (rogercoathup), Salvatore (DarkWolf),Sanket Parmar (sanket.parmar), Slava Abakumov (slaffik), Stagger Lee (stagger-lee), Stephen Edgar (netweb), Sven Wagener (mahype), wordpressrene. BuddyPress 2.8 is called “San Matteo” after a great pizza restaurant in New York City. San Matteo specializes in the “panuozzo”, a pizza-sandwich hybrid native to Salerno, Italy. The proprietor of San Matteo is a friendly fellow who insists on speaking Italian even to customers who don’t understand a word of it. If you find yourself in the neighborhood, be sure to stop by for a great pizza. Time to Go Get 2.8.0! Grab BuddyPress 2.8.0 “San Matteo” from the wordpress.org plugin repository, or right from your WordPress Dashboard.